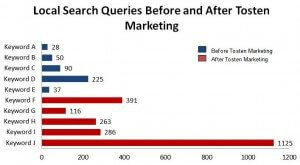 SEO results can take time, but these results displayed below are typical! Some programs require more time than others, but with time, results will come. We can tell you all day long how we’re different and how our program is unique, but that’s not what you particularly care about. You want to know if our program works. Highlights: 3,500% Improvement & 20/20 targeted keywords on page 1. Highlights: 2,900% Improvement & 33 targeted keywords on page 1. Highlights: 420% improvement in just two weeks. 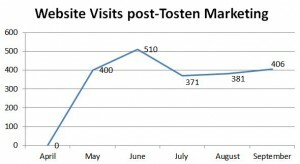 Highlights: 600% improvement in one month, and 23 targeted keywords on page 1. Highlights: 750% improvement & 35 targeted keywords on page 1. Highlights: 580% Improvement & 53 targeted keywords on page 1. Highlights: 1217% improvement & 38 targeted keywords on page 1. Below you will find examples of agencies we’ve marketed for. While we can’t guarantee our results within every market, the below examples should provide you with information that will aid you in your decision when looking for a marketing company to market your insurance agency. 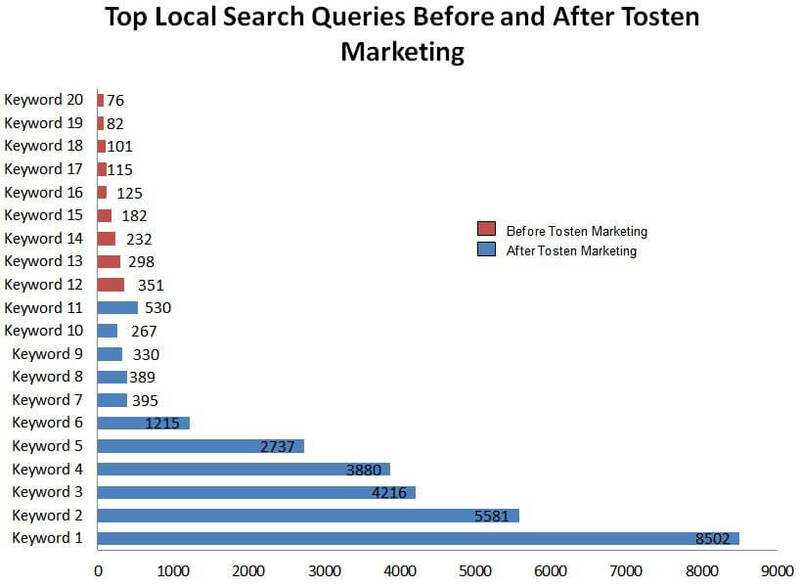 Before partnering with Tosten Marketing, this agency did not show up in many local searches. 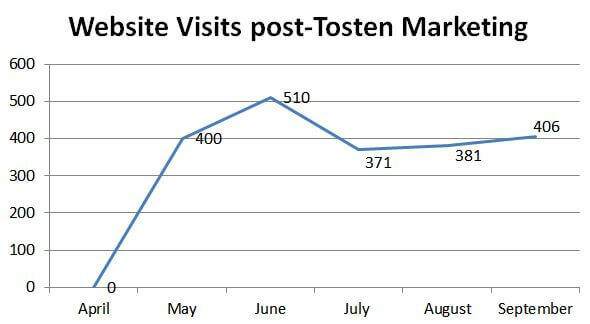 After launching a new website and optimizing the site along with the local search sites, the number of search results that yielded website traffic went up in some cases 30-fold. 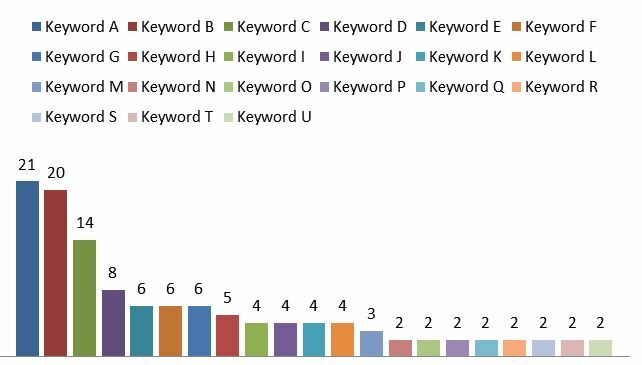 We were also able to not only get more specific with a keyword, but increase traffic as well with the same keywords that were getting traffic before. With local search optimization as well as on-site page optimization, we were able to create substantial and consistent website traffic. Not only is the traffic heavy, but it is also mainly new visitors. Over 80% of website traffic has not visited this website before, meaning that they are generating substantial leads. When we meet with a new client, we ask them what products or niches they would like to target for their website. We then do keyword research to determine what keywords will generate the most traffic for those products. 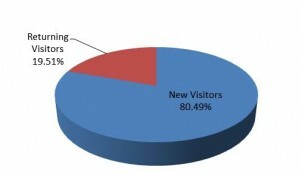 (the numbers signify how many visits their site is receiving because of the specified keyword). 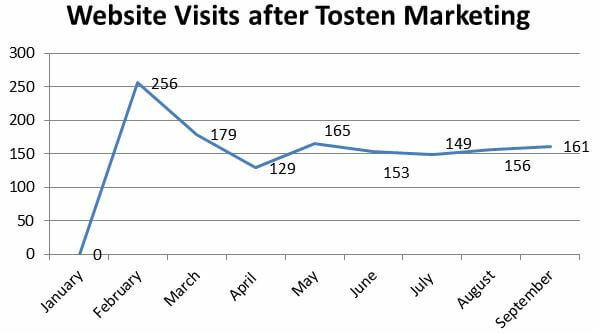 (results below from Google only) Before partnering with Tosten Marketing, this agency had average results for local search. After launching a new website and optimizing the site along with the local search sites, the number of search results that yielded 18x better results for local search impressions. With local search performing wonderfully, it is important to note that many consumers may stop with local search and simply call your agency. 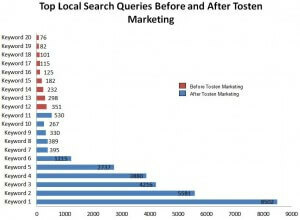 There is not a substantial click through rate to a website from local search. With proper optimization of a website, we were able to generate the below traffic in addition to what the local search results above were. 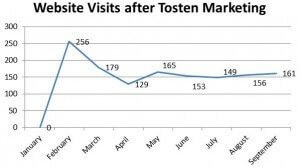 As in our example A, this agency website as well is generating over 80% new visitors to their website. Please note, these are representations of actual clients, but your results WILL VARY. While we do our best to produce similar results, it is impossible for anyone to guarantee any rankings, or website traffic. We do not guarantee results. If someone makes you a guarantee of website traffic, this should be a red flag. Only Google and Bing can guarantee traffic through their pay per click advertising. Please ask us to review the results with you prior to beginning our program.